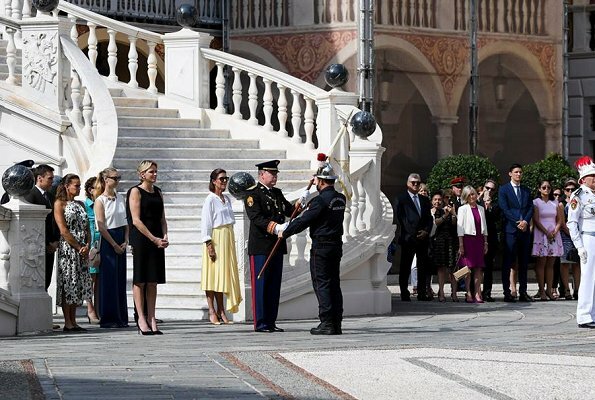 Yesterday, Prince Albert II, Princess Charlene, Princess Caroline of Hanover, Princess Stephanie of Monaco, Pierre Casiraghi, Beatrice Borromeo, Andrea Casiraghi and Louis Ducruet attended a handover ceremony held at the Principality Palace. 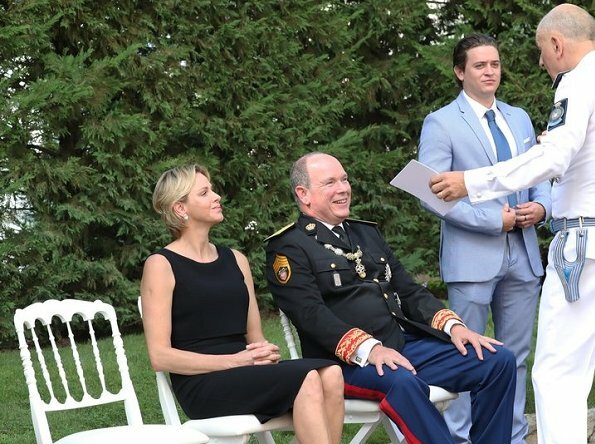 They attended the ceremony of handover of power between Colonel Luc Fringant (outgoing) and Colonel Tony Varo as commander of the police force in Monaco. Vous avez raison. Prince Albert a prit son temp mais il a bien choisi sa princesse. Charlene est ravissante. Charlene looks wonderful in the LBD. Must have been a nice event. Love the colours for Caroline's outfit but the style of the skirt is just plain silly - her hair is looking quite good. Stephanie is wearing a beach cover up, scraped back hair and the grottiest pair of espadrilles known to humankind. Combined with her wide cheery smile the effort she has made is astounding. 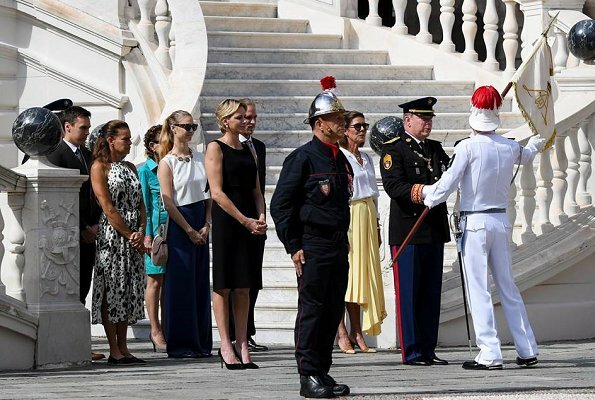 Charlene's dress is lovely but she looks dressed for a cocktail party not an afternoon ceremony in the sunshine. I like her hair at the moment. Beatrice looks ok although the trousers are quite long. Anyway, fashion aside it's nice to see an event that so many of them attend. ik vind het een leuk stel!!! en dat blijf ik vinden. Isn't Beatrice pregnant with her second child? No, she gave birth to him last spring - his name is Francesco. Elle fait toujours la moue! Caroline a plus de classe ! Good to see them lol out. Quite a range of outfits. Not clear how formal this event is. Feels like Charlene had a different memo than the majority of them. Caroline seems in the ‘middle’ - between cocktail party attire and beachwear and flats. So I will go with her. Fashion wise, very diverse styles in family. With some exceptions, generally they are not boring. If not always appropriate.